Here is the next video, on which I play Twinkle on each. I screwed up on the second Twinkle using the rental 😛 (well maybe on both, lol), so sorry about that, and I always welcome the constructive criticism in my playing 🙂 I notice I have to work on keeping the bow straight. Anyhow, tell me what you think about the sound of both (and my playing :-)). Thanks! I kind of likke the sound on the rental but feel secure that with some good strings the Cecileo will sound just as good if not better. I agree with Kevin. I am sure that it will sound better in a few months as well. 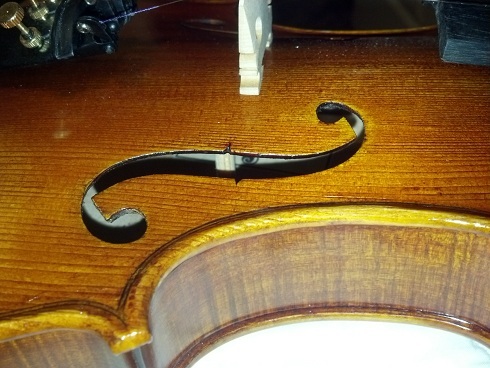 Brand new violins need to be played on and broken in. The difference is big. I notice a huge difference after just an hour of playing. With the HC602 it was like night and day only after 30 minutes though I liked the feel right away. The strings will most definitely make a difference and I am pretty sure that your rental has better strings too. To be truthfull, I don't hear all that much difference. If you fast forward and rewind to both spots on the video where he starts the beginning of the song, there's really not that much difference in tone quality, at least that I can hear. But a new set of strings I think will make a world of difference. Good post. Thank You for the videos, SirRyu! Thank you for your feedback! After playing on both yesterday, I decided to take the rental one back, as the Cecilio has lots of potential. I even got to keep the rosin that came with the rental, which is better than the rosin that came with the Cecilio. 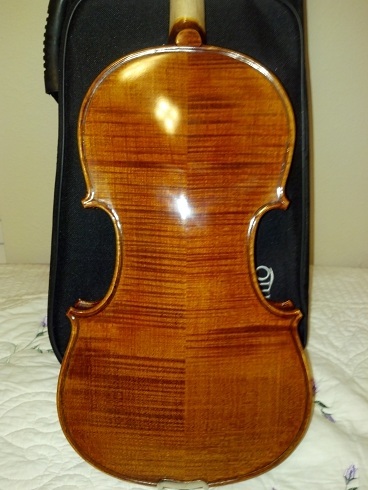 I think I got pretty lucky and got a great violin, as am sure no two are identical, even if these are mass produced, so I got a gem, as I said on my review in FM's shop. I already have a set of strings, the Addario Prelude, which am thinking on throwing on there for now, and then I will get some better ones. I also got my mute yesterday, so now I can practice later at night, which will allow me to get more practice time. The CVN-500 will be put to good use 🙂 and as FM has said, am excited about the sound getting better as the violin matures. After playing on both yesterday, I decided to take the rental one back, as the Cecilio has lots of potential. I even got to keep the rosin that came with the rental, which is better than the rosin that came with the Cecilio. A wise choice, just from an expense point of view. Have fun with your Cecillio! Hi Sirryu! To me it appears that you were comfortable with the cecilio and I like its sweetness. You are doing a fine job. Well Moris how do you like your 500 now? I have one and after 3 months I still like it. Excellent work on the still photos, SirRyu. It's almost like being there. How much does the CVN-500 weigh? Did you find that the sound improved after breaking it in? Nobody mentioned taking the new violin into a shop for sound-post adjustment. I think that maybe when the seller/maker sets the sound post, one of the criteria is that it shouldn't be knocked down during shipping. I am thinking that they put it in tighter than normal and even make it longer than normal so that in case the bridge falls, the sound post won't fall too. I mean that the sound post setting may not be optimized only for sound. Anybody agree or disagree with that? The sound-post should not have fallen. Then again one never knows how these packages are being treated in the shipping process. Perhaps the box was thrown or dropped hard. The sound-post should not be too long or too tight, rather just right for the optimal sound. We always ship our instruments with most of the pressure still on the bridge but put cardboard between the fingerboard, bridge and tail-piece so that the bridge won't fall. So far I don't think any of my shipped instruments have had a problem. The Cecilio's are drop-shipped from the Cecilio factory directly to save the extra shipping cost and keep the price down. 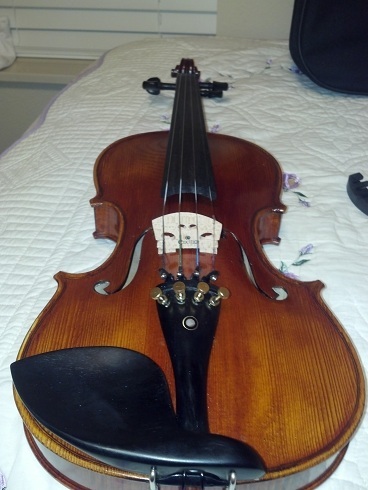 If anyone gets a Cecilio violin with the sound-post fallen inside contact the seller and have them arrange for an exchange. This is not right and resurrecting the post is not your responsibility. Sorry to hear that you had that problem. @FM: I did not have a sound post that fell. I mean that maybe the factory puts the sound post in extra tight so that it won't fall during shipping. It is good that the factory makes sure that the sound post doesn't fall. But I mean that doing it that way may not be the best for the sound quality. And so do you think it might improve the sound to have a luthier adjust the sound post after the violin arrives? Usually you can improve a violins sound by playing around with the sound-post. However, I've known people to make it worse and not able to find the exact optimal spot again after having lost it. 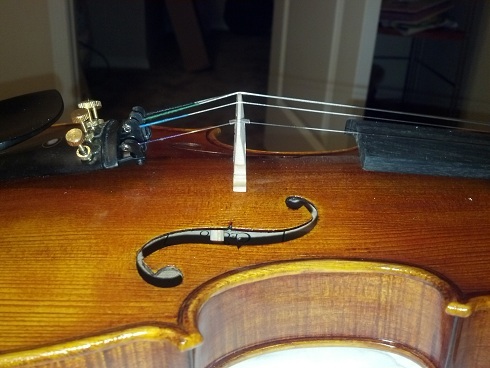 I really don't think that the manufacturer sets the sound-post extra hard and yes it would make the violin less open and harder to react. Well, I had been missing in action for a good six months looks like I am still practicing the Violin, not as much as I would want to, but when I can I pick it up and play. I have been busy with a house I moved into, in which I have a little guest house which I am in the process of transforming into a recording studio and just this last week, I got the plumbing fixed on it, and I now have running water for unlimited coffee making! I have also been getting back into the piano, so I can work with my daughter and start training her ear. So, If I am not playing the violin, I am playing the piano, or my good ol' drums! Well, I want to answers a few questions that were brought up on this post regarding the CVN-500! Let's just say it was a great investment! It holds its tune better than the eBay violin, I find myself having to tune that other one more often. 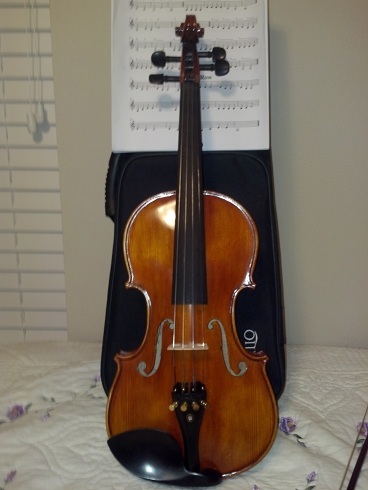 Also, the CVN-500 is heavier than the eBay violin, but I kind of like it, makes it feel more solid. Also, when I got the violin, the sound post was on the right spot, so I did not have issues with that. Yes, I feel that the tone changing a bit on the Cecilio, and I have not even put a better set of strings on it, I still have the stock ones on there. Oh, and Happy late New Year to everyone! Sorry, I know this is an old post. I'm very interested in buying the cvn 500 and I'm trying to read everything about it that I can. I was under the impression it was a satin finish? This looks very shiny. Are the newer versions of this model less shiny or is this an accurate pic for what they look like now?